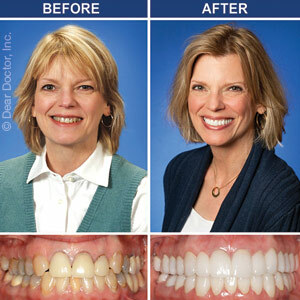 Transforming your smile can be a huge undertaking. And while we have the technical skills, experience and understanding of aesthetics to perform a smile makeover, your input is just as necessary to achieve a satisfying result. Your part really has to do with expectations — what do you see when you look in the mirror — and what do you want to change? Here are 3 questions to help guide you in shaping your expectations for that new, beautiful smile. What do you dislike about your teeth? This is really about specifics and not just a general feeling of dissatisfaction. Are your teeth misshapen, chipped or missing? Are they discolored or stained? Is the spacing off or do you have a poor bite (malocclusion)? Getting a sense of what you perceive as unattractive will help us formulate a plan to improve the appearance of those problem areas. Are you concerned with how much your gums show when you smile? Your teeth may be perfect, but if your gums seem to steal the spotlight when you smile (known as a “gummy” smile), you may need some remedy like veneers, crowns or even corrective surgery. Which procedure depends on whether the crowns of your teeth are too short in proportion to the gums, or the muscles in your upper lip are allowing the lip to rise too high when you smile. A dental examination will tell all. Do you want a “Hollywood Smile” — or just a more attractive, natural you? Smile makeovers aren’t just about clinical alterations — it’s just as much about your personal perceptions of beauty. Some patients want the perfectly shaped, aligned and dazzlingly white smile that’s the epitome of Hollywood. Others want only to enhance their smile, perhaps even keeping a few unique imperfections they’re comfortable with. It’s important to know which person you are, and to communicate that with us when we’re putting together your makeover plan. Changing your smile is a big step in your life. You can help make the process more satisfying and successful if you understand what you want to change — and why.